Bjarni has long held onto a letter from former lover Helga, with whom he shared an illicit, impassioned love and whom invited him to leave his wife and his farm and follow her to the city. Years later, as he reflects on a long and simple life shepherding in the Icelandic hillsides, he finally finds himself ready to explain why. With retrospective clarity and poetic affection, Bjarni pens his Reply to a Letter from Helga, weaving a life of longing for Helga’s sensual presence and the visceral pleasures of daily exposure to the elements. He has knowingly avoided the glamorous choices of modern living and taken comfort in the measured cadence of nature’s cycles—and thus he reduces the human condition to a series of mating seasons, passed on the land toiled by his forefathers. "Reply to a Letter from Helga" extols handcraft and hands, the known and cared-for earth, physical intimacy, the inheritance of dirt and myth. It mourns all that has been lost by way of convenience, all that we no longer understand, all that we can't touch. It cherishes, convicts and finally confesses. An advice for readers looking for true passion: forget about E.L. James and the young Gray and choose Birgisson and old Bjarni! 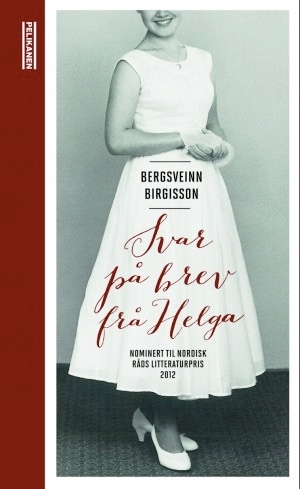 I literally fell into Bergsveinn Birgisson's "Reply to a Letter from Helga". Sheer love, told from the point of view of a man who is in total symbiosis with nature in its crudest forms, who fails to make the right choice at the right time and spends all the rest of his life regretting it; love for animals, fish, cattle, cold, sea, grass, which morphs into love for a woman and a kid. A timeless tale, masterfully told, balancing between the knowing naiveté of the main character and the heritage of an entire culture. Such a gem of a book, really. (...) Literarily coincidence between Nature and Mind. And it is Birgisson's writing that strongly imposes this relationship, thanks to a language - even though Birgisson is also a profound scholar - used to become a powerful tool for telling what is definitely "human".